Kansas State’s offense looked stunningly impotent in Saturday’s 14-7 loss at Vanderbilt. While there were certainly negatives to dwell on, it wasn’t a completely hapless performance. Let’s dig into it. 1. The defense had its best performance of the season. It wasn’t flawless, but holding any Power 5 opponent to 271 total yards and just 11 first downs is an admirable effort. The Wildcat defensive line finally got some pressure on an opposing quarterback for the first time this season. Oh yeah, and the defense also scored a touchdown. Kendall Adams’ scoop-and-score in the second quarter was reversed after a review, but there were no angles that showed Vandy quarterback Kyle Shurmer down by contact. 2. Justin Silmon is alive and well. While most K-State fans were only excited about Alex Barnes’ sophomore campaign, Silmon had to wait a couple games to make his debut. He looked great against the Commodores, albeit in very limited action. K-State needs both of them to be at their best in order to sustain a ground game in Big 12 play. Silmon appears ready for it. 3. Vanderbilt’s defense is better than most Big 12 defenses. 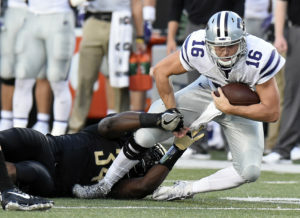 The Commodores’ reputation as an SEC bottom-feeder led to some dismissiveness from K-State fans about their capability. Vanderbilt is a solid team, and will be headed for a bowl game. The SEC East is not very good and Vanderbilt may have a chance to contend for a spot in the conference title game. Vandy’s overall style is very different to what K-State will face in the Big 12, on both sides of the ball. Not necessarily better or worse — just different. K-State has two weeks to work on things, and I believe Bill Snyder will find some buttons to push. 1. K-State’s receivers came crashing back down to earth. After an offseason full of hype, the Wildcat receiving corps had two excellent games to start the season. But Saturday night was a different story. Byron Pringle had multiple drops at costly moments, Isaiah Harris had a couple as well, and there just wasn’t the consistent separation from cornerbacks that K-State will need moving forward. There’s no reason to panic about this yet, but in the first test of the season, the Wildcat wideouts struggled. 2. Sophomore Alex Barnes just doesn’t look like freshman Alex Barnes. It’s early, and the offensive line has contributed to the problem at times, but Barnes certainly isn’t the “automatic 7-yard gain” that he was a year ago. I believe this will be one of K-State’s biggest priorities during the bye week. Barnes is too talented to go all season averaging less than 5 yards per carry. 3. Barring a fairytale-ish run, K-State isn’t going to contend for a national title. It was a long-shot from the beginning, but there was some buzz about K-State being a dark horse for the College Football Playoff. Those hopes are virtually extinguished, and the Wildcats one and only focus at this point should be getting to the Big 12 Championship Game. That objective, by the way, is still very much within reach. A new season starts next week for every team in the Big 12.